During Labor Day weekend I had some time set aside to photograph construction projects in progress. However there was quite a bit of rain that weekend, so I curtailed the effort and the available photos are lower quality than my normal standards due to the cloudiness. The interchange at the Grand Parkway and Interstate 45 north, looking north along IH 45. 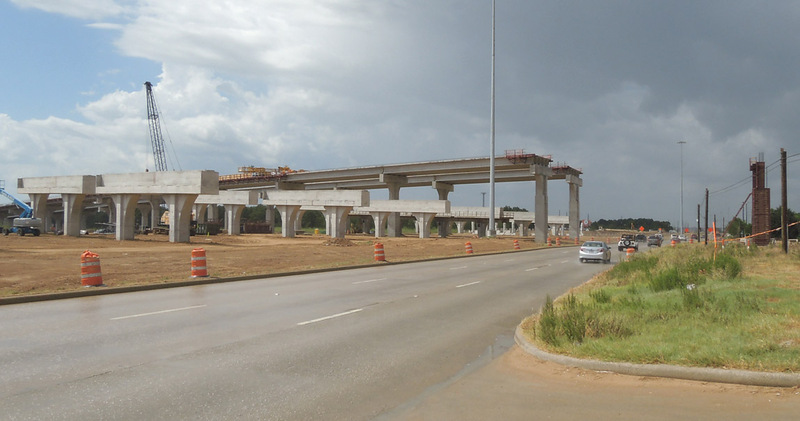 Another view at the Grand Parkway/IH 45 interchange. Driving southbound on IH 45 at the Grand Parkway interchange. The Grand Parkway at the Tomball Parkway (SH 249). The main lanes on both highways are tolled. A storm had just moved through the area. 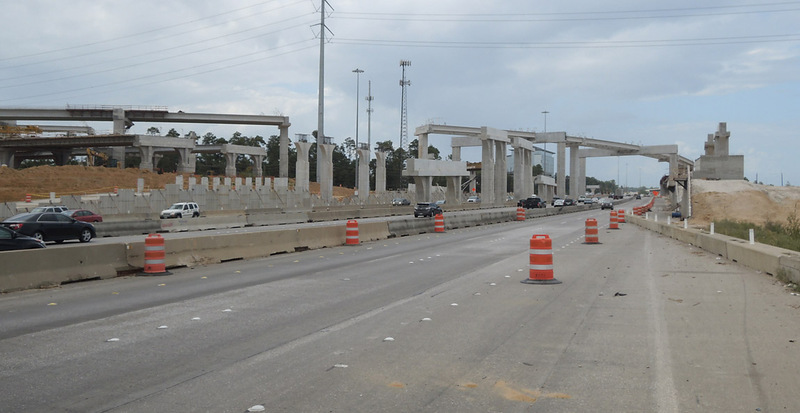 Piers for the main lanes of the Tomball Parkway toll road (SH 249) on the south side of the Grand Parkway interchange. 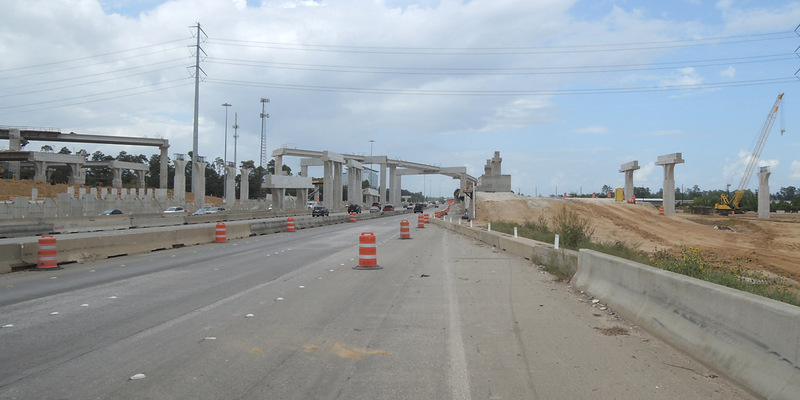 Work on the Grand Parkway about a mile east of SH 249. 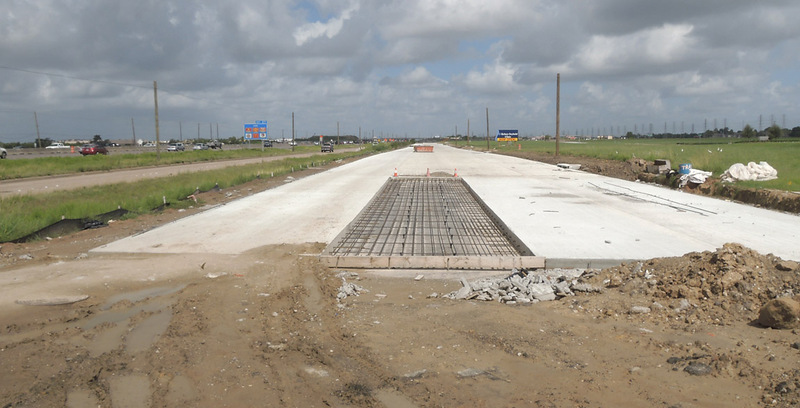 This is at Interstate 45 and SH 242, where two direct-connector ramps are under construction. Due to rain, the photo had to dodge the wipers. 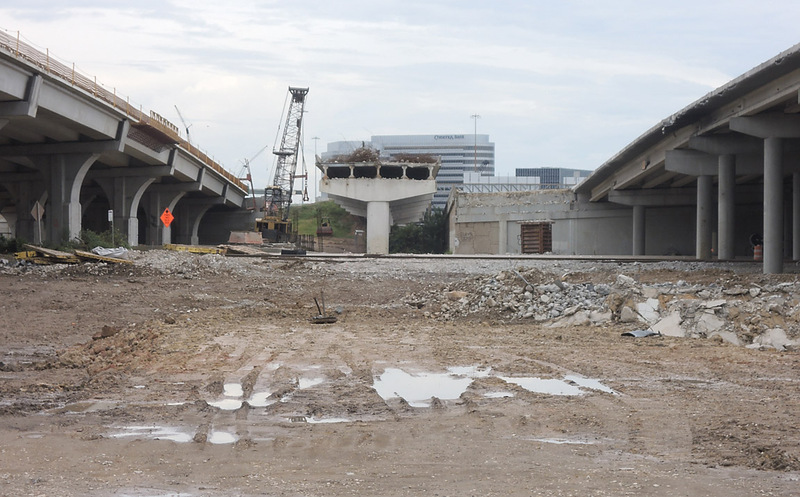 In the middle of the photo is the last remaining section of the elevated HOV structure which ran along the west side of Loop 610 between US 290 and Interstate 10 west. The structure was demolished as part of the complete reconstruction of the interchange. On the left is a new bridge structure, and on the right is the existing structure which I believe is also destined for demolition. 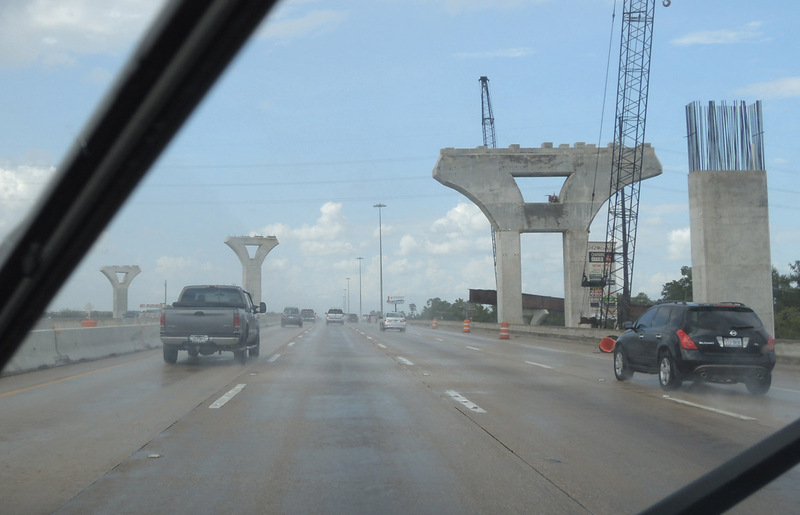 Now the photos shift to southeast Houston along the Gulf Freeway. 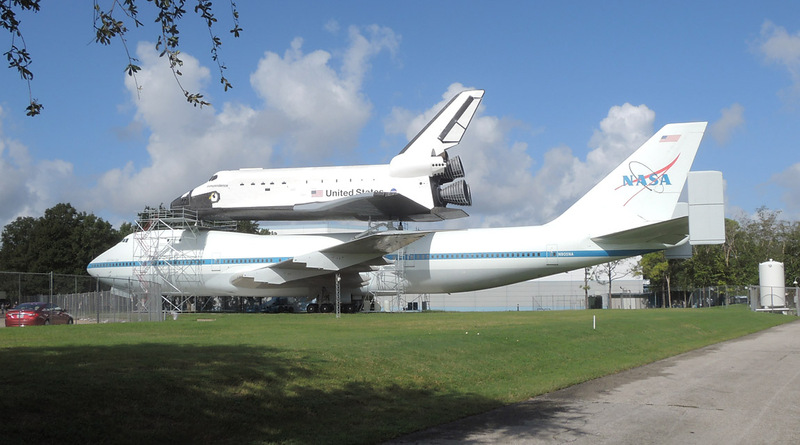 I started at Space Center Houston, which has a new exhibit of the space shuttle and its Boeing 747 transporter. The exhibit is nearly complete with some finishing work in progress. 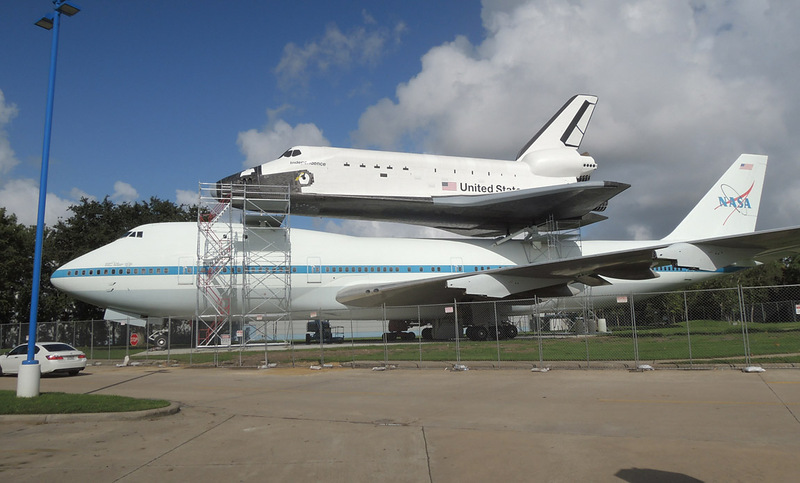 To see the exhibit, you need to enter the parking lot of Space Center Houston. Parking is $6. You could park elsewhere and walk in, but it would be a long walk. 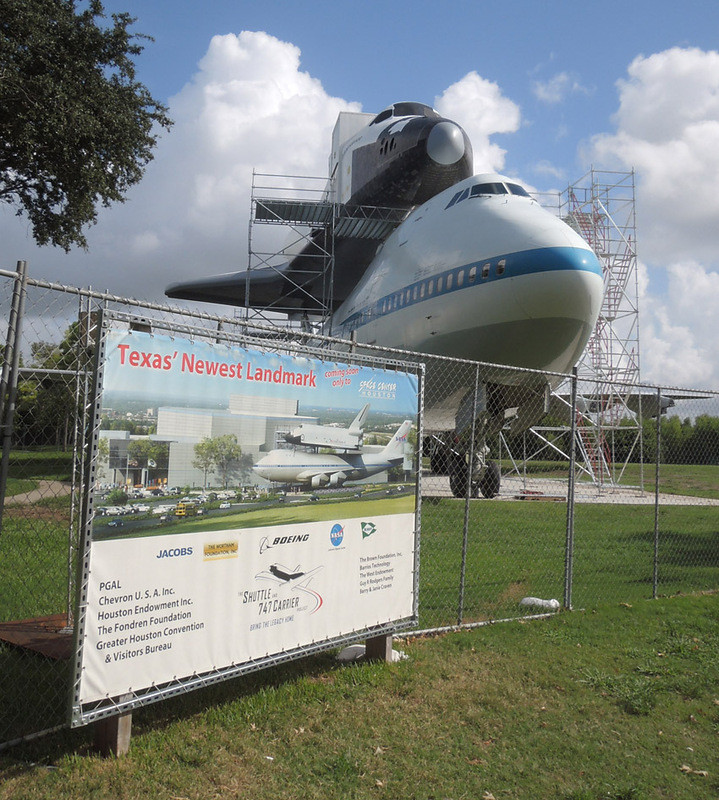 The area around the exhibit is fenced, but I'm thinking there will be closer access when it is complete. 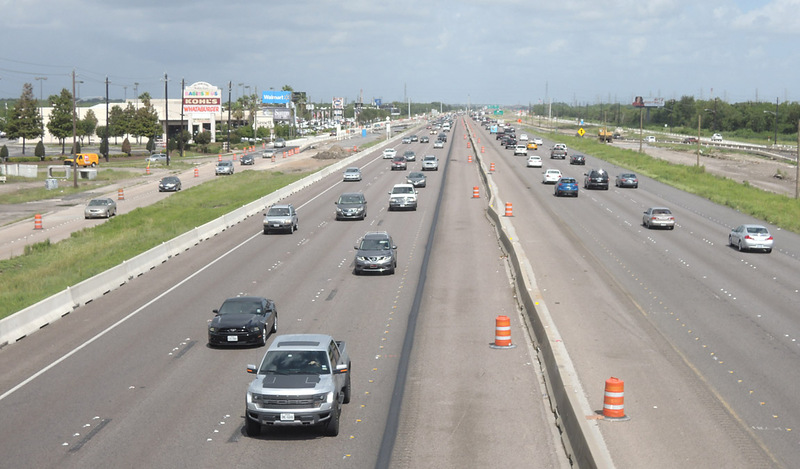 Work is in progress to expand the Gulf Freeway to 10 main lanes from north of NASA parkway to Dixie Farm Road, near Beltway 8. The right-of-way is being widened by about 50-60 feet to accommodate the new lanes. Displacements are minimal since there is vacant land along one or both sides of the freeway. This is the existing overpass at Bay Area Boulevard, which will be replaced. 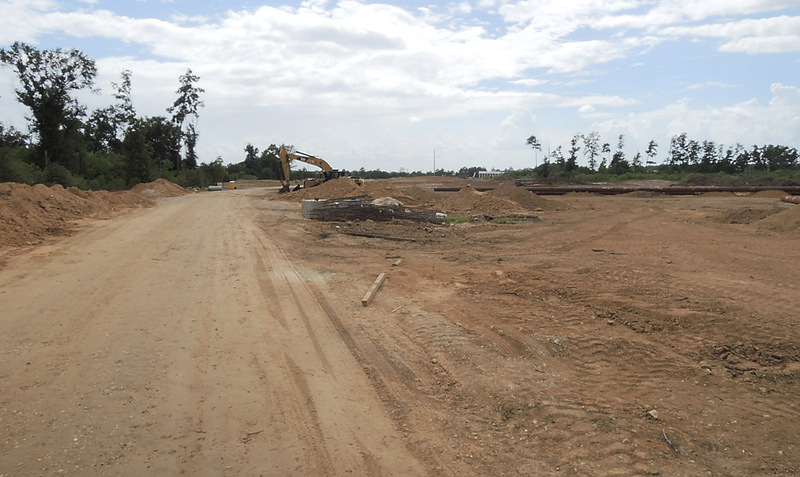 On most of the corridor, current work in progress involves work on the frontage roads only. Most of the main lanes are unaffacted so far. 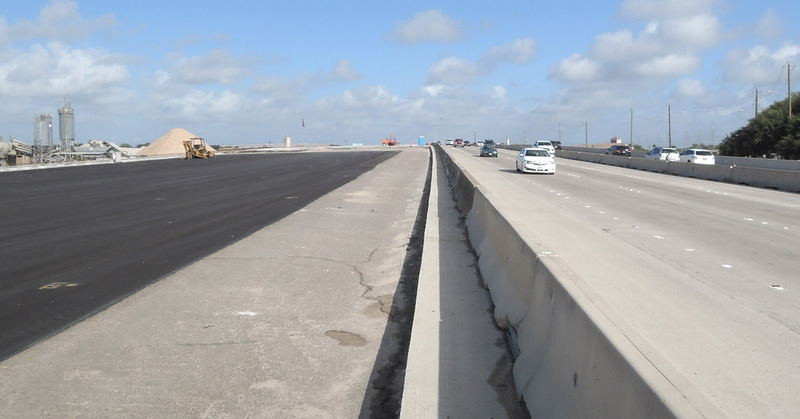 This view looks northbound (northwestward) from the Bay Area Boulevard overpass showing the new northbound frontage road under construction, which is on new right-of-way to the east of the existing frontage road. 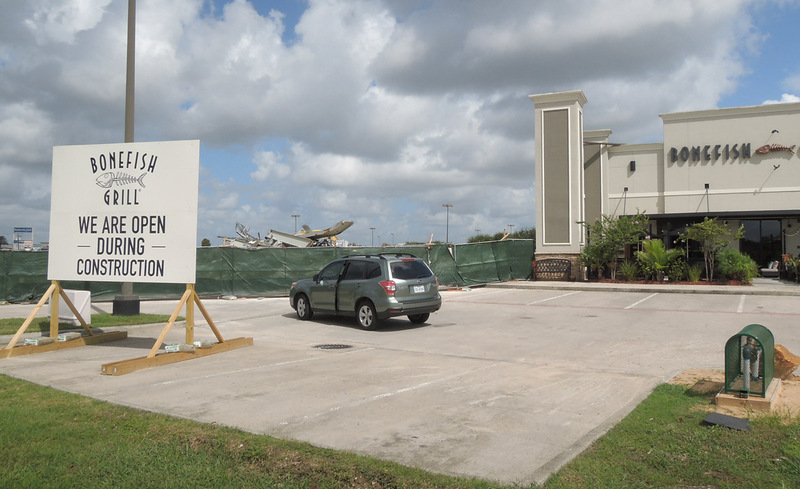 Displacements were minimal for this project, but the building adjacent to the Bonefish Grill was demolished. The remaining rubble of the building that was adjacent to Bonefish Grill. This is the new northbound frontage road under construction between Bay Area Boulevard and El Dorado Blvd. This view looks northbound (northwest) from the El Dorado Blvd. overpass, showing the new northbound frontage road which is carrying traffic. This view from the El Dorado overpass shows that the main lanes are not yet affected by construction. 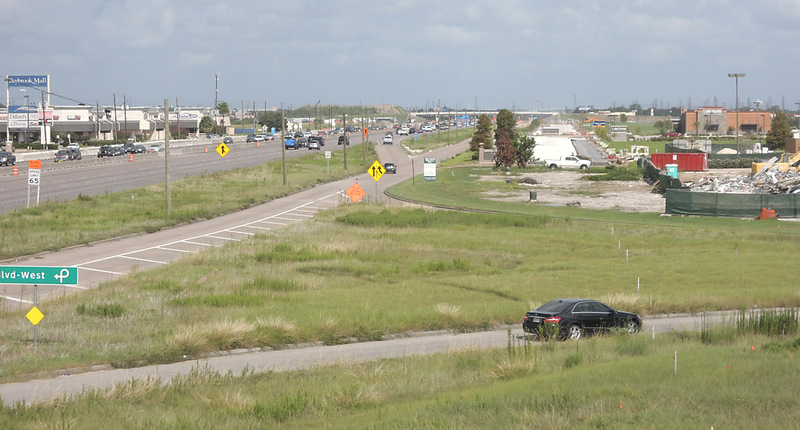 Here is the new northbound frontage road between El Dorado and Clear Lake City Blvd. 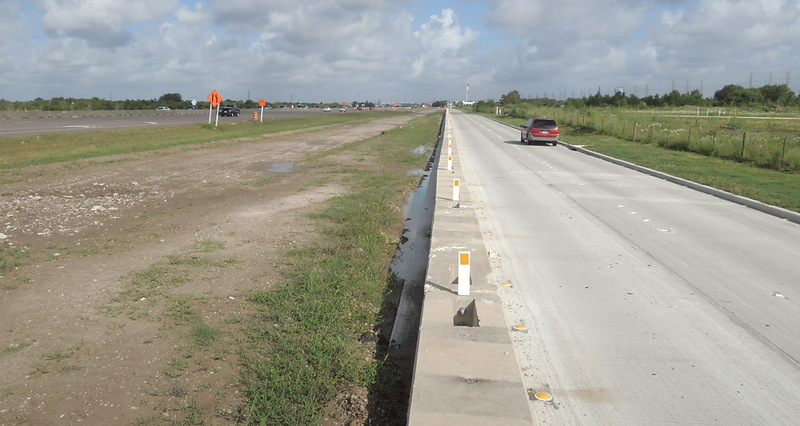 The roadbed of the original frontage road is visible to the left of the new frontage road. At Dixie Farm road, work is much more advanced and the main lanes are nearing completion. 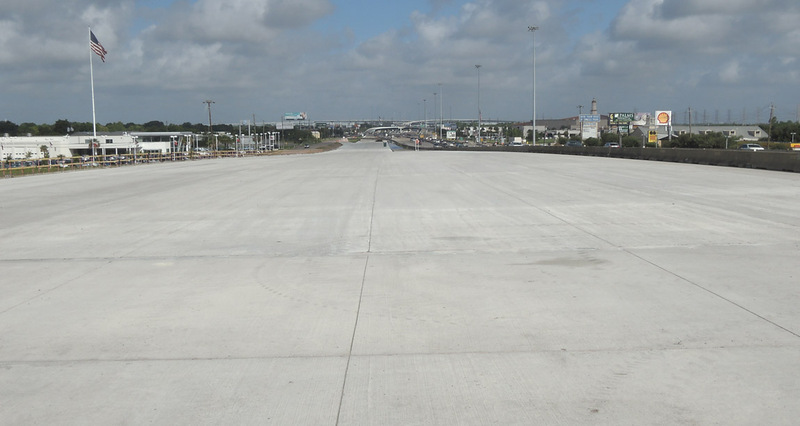 This view shows that the traffic is on the new pavement on the right, with the base for the new southbound pavement awaiting concrete paving on the left. Concrete pavement for the new southbound main lanes at Dixie Farm Road will be placed on this location. This is the pavement for the southbound main lanes on the north side of Dixie Farm Road. 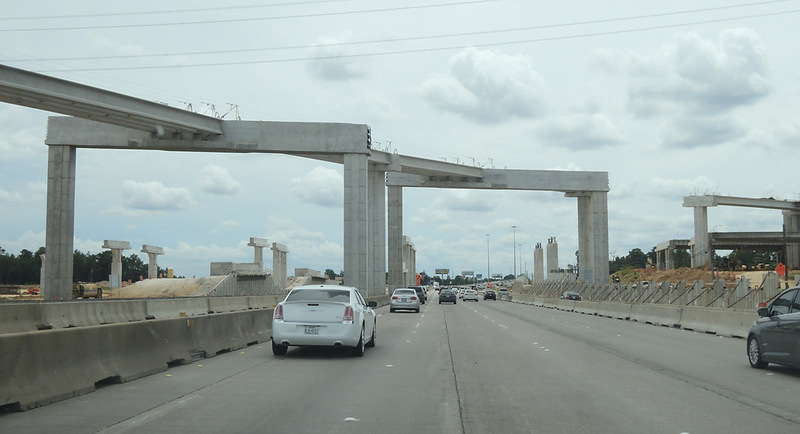 The Beltway 8 interchange is visible in the distance.